A low lint absorbent cloth used in healthcare for scrubbing with the rough surface and polishing with the smooth surface - like 2 wipers in one! Healthcare wipers have to withstand a lot of use in the workplace. Nursing homes, childcare facilities, preschools, and aged care facilities deal with a lot of accidents from the people being cared for. In addition, just the normal act of living will create messes. You will frequently need healthcare wipers that are solvent resistant. So many baby wipes and healthcare cloth towels come apart when you try to use any kind of cleaning chemical with them. 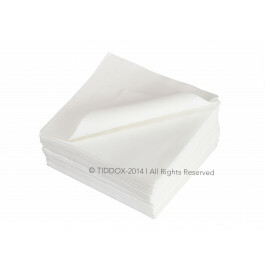 TIDDOX's SOLVENT RESISTANT WIPES are tough enough to scrub with, but soft enough to use on the skin. One side of the healthcare cloth is textured with an abrasive that stands up to tough scrubbing. The other side is smooth and low-lint for use on shining surfaces or for patient care. These childcare wipers come in packages of 50, and take up less room than a bag of rags with the same number of cloths. This packaging makes it possible to keep them handy, with one package in each work area for convenience. Keep on in the kitchen to use as a kitchen towel, one in the bathroom or changing area, one at the nurses’ station, and one in the janitorial closet. These absorbent, disposable healthcare cloths will soak up any liquid or semi-liquid. They are great for hospital grease cleaning or for absorbing chemicals and other messes. Just wipe up the mess and throw them away! Order a few cartons of TIDDOX's HEALTHCARE SOLVENT RESISTANT CLOTHS today, and you won’t want any other healthcare towel in your facility!